migration « Nothing in Biology Makes Sense! 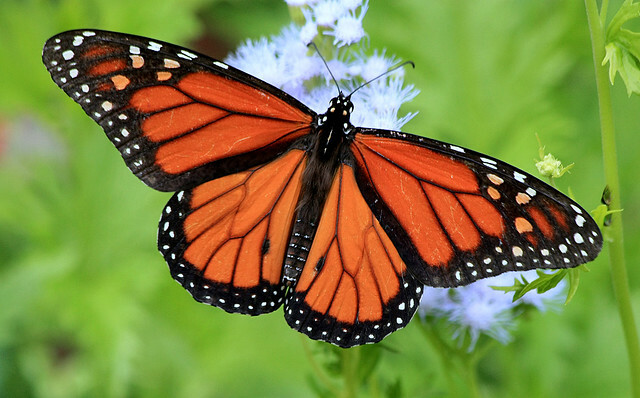 Monarch butterflies (Danaus plexippus) are among the most widely recognized wild creatures in North America. Their distinctive orange-and-black wings, which warn predators that the butterflies are chock full of toxins from the milkweed they eat, make them easily spotted in backyard flower beds. They’re also known for a massive annual migration, flying thousands of miles between wintering colonies in central Mexico and summer sites across the United States and Canada. More recently, it’s been discovered that female monarchs infected by parasites respond by laying their eggs on food plants that can prevent the parasite from infecting their offspring. Monarchs are also one of the more visible victims of the massive changes humans have made to the world around us. Increased conversion of farmland to corn production has reduced the supply of milkweed, the butterflies’ only food plant, across much of the Midwest. It’s gotten so bad the number of monarchs making the annual migration back to Mexico hit a record low last year, and while things were better in 2014, a nationwide campaign to encourage planting of milkweed in home gardens is only beginning. For all our familiarity with monarchs, we’ve known remarkably little about their evolutionary history. That’s changing rapidly now, as evidenced by a paper published last month in the journal Nature, which uses a big new genetic dataset to trace the origins of some of the monarch’s most distinctive features.